As part of some reading for my current study, in late 2014 I was challenged with the question, “Can we simply ‘update’ things as we go, or is it time to complete rethink what schooling is?” I reflected that each school has its own context and some asked this question ten years ago whilst others are yet to ask the question. As we know, the digital age has changed society and, very obviously, schools are a part of that society. 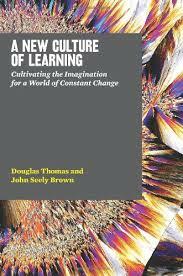 The learning landscape for schools has changed with the onset of the digital world in which we live and this new earning landscape is brilliantly and articulately explained in A New Culture of Learning by Thomas and Brown (2011). The authors argue learning environments must take into consideration the great changes that have occurred with digital technology. Thomas and Brown argue that we are obligated to do this because the world is changing faster than ever and our skill sets have a shorter life. This presents great challenges to schools and education systems working with students to develop skills that will prepare them for post school life. Thomas and Brown remind us the world is getting more connected than ever before and that the need for mentors is a priority. They regularly remind the reader that schools need to be innovative, a need which is sustained with a commitment to cultivate imagination which can be supported with creative use of social media and digital technologies. John Seely Brown’s Youtube clip The Global One School House continues the message. In this clip Seely Brown contests there is a need to completely rethink the learning landscape because working as individuals will not sustain learning. This prompts many questions for education leaders of today. To ask the right questions is necessary in providing schooling which is relevant and supportive of student learning growth; learning growth that must address the skills of communication, collaboration, connectivity and critical thinking through formative assessment and not just (or should I write “rather than”) scores and grades for a summative report. The longer a school, system, state or country takes to ask those disturbing questions, the longer it will be before schooling provides an education which is relevant and pertinent for students who enter an ever changing world. There have been ‘lead schools’ who have bravely asked questions and boldly taken on the exciting challenge of looking at new and better ways for schooling. Northern Beaches Christian School with its Sydney Centre for Innovation and Learning is the pacesetter when it comes to innovative approaches to learning characterised with greater relevance, interest and engagement for students. Northern Beaches is led by Stephen Harris who is ably supported with great communicators such as Anne Knock and innovators such as Steve Collis. First and foremost Stephen, Anne and Steve all see themselves as learners who ask curious “what if” questions which then prompts and ignites the imagination, creativity and innovation that flourishes at NBCS. Secondly, they share their insights, learning and questions through their blogs and Twitter. Thirdly, they generously open NBCS for others to visit, look and learn. Thirdly they ‘walk the talk’ by seeking, offering and encouraging communication, collaboration and critical thinking with other thoughts leaders within schools and outside education. Other schools have developed innovative learning cultures which have improved and even transformed the learning landscape for students within their schools. Marrylands East Public School led by the innovative John Goh have early start and finish times. Parramatta Marist High School has adopted project based learning so successfully, it regularly receives much media attention. Mater Dei Catholic College, Wagga Wagga * implements TED in Year 7, teacher team based planning and team teaching in Religion, English and HSIE in Year 8, a compressed SOR 1 course in Year 11 (where students sit the SOR 1 HSC exam at the end of Year 11) and a 9-day timetable for Year 12 students. Also, as recently as Setepmber, 2014 Delaney College launched its new model of learning and has developed connections with Telstra to promote meaningful, real-life learning for their students. All schools were bold enough to ask critical questions and have achieved much progress in their aim to provide schooling which is relevant, engaging and challenging whilst also supporting students to develop skills for when they leave school. Their climate for learning allows students to exercise choice and pursue interests whilst still adhering to mandated curriculum requirements but moves away from the ‘one-size-fits-most’ approach to traditional curriculum delivery. Furthermore, there is a greater emphasis on, and explicit reference to, the skills of creativity, communication, collaboration and critical thinking. All this has come from schools with leaders who adopted, and continue to adopt, a ‘complete rethink’ mindset rather than an ‘update’ approach. What other schools approach learning with a ‘complete rethink’ mindset and what can we learn from them? I would be interested in your thoughts and comments. Regards Greg Declaration of Interest – I declare that I was Principal of Mater Dei Catholic College, Wagga Wagga from 2008 to 2014 inclusive. Thanks Greg for drawing my attention to these innovative schools. It’s heartwarming to see our K12 sector embrace emerging technologies, even if only in pockets at this stage. Although I am a strong advocate of learning and the development of learning skills, I caution against the abandonment of teaching. I see both teaching and learning as crucial components of what we call a school “education”, and of course digital technology can support both of them. Thank you Ryan for taking the time to comment. There is no doubt that teachers and teaching are pivotal for change and transformation. As facilitators of learning with the need for direct instruction when required, theirs is a crucial role within education. My hope is that teachers also see themselves as a ‘coach’ and assist students to become better learners, connected to their real world with increased ability to collaborate and communicate to work with others. When teachers “get this”, my experience is that real change, even transformation takes place in schools. Again, thanks for taking the time to comment and “Best Wishes” for 2015. I think it’s easy to polarise the ‘total reinvention’ VERSUS incremental changes. In most of the creative industries, we make a conscious effort to reinvent the content, but keep the format the same, or reinvent the format, but have some familiar content, or reinvent the medium, but keep the content and format familiar for the user. If you innovate on too many points at once then people get lost and quality suffers. I reckon the same is true in learning – we have components that make up learning, and it’s knowing which one you are going to overhaul today, and then TEST the impact this has. If it makes no difference, don’t invest any more in it, and ditch the change. If it works, keep going. I take your point about “incremental change”. We don’t have to change the world overnight. It is more about we a school/system wants to be in five years. NBCS use the metaphor of a “Bunny Hop”. They pick an aspect of learning, a year group and they will ‘jump’ into a change, nibble around for a bit (that’s the ‘action research’ that Ryan talks about or the impact TEST to which you refer), then look up and see “where to next”. If it makes no difference they move on. A lot of incremental changes can achieve significant change, even transformation. Thank you Greg – I enjoyed the read and it is wonderful to know that there are many innovative schools and educators who are already and successfully driving the necessary skills and qualities needed for our students future. Like you highlighted these people and schools are openly sharing their learning which is invaluable. This new mindset – creating opportunities to think, share, explore, collaborate and design is still a difficult concept for many schools but it is comforting to know that schools are making moves towards “rethinking the way in which education is happening in our schools” . Real change is difficult, especially as this is an area that has never been navigated before. Along with this change is also the many other complexities that occur in our schools that leaders and teachers deal with. However the challenge is there for all of us and collaboration/mentoring is vital for all of us to continue our journey of learning for our kids futures. Thank you again Greg for posting and sharing! Thanks for taking the time to comment. I especially like your phrase, “….. the challenge is there for all of us and collaboration/mentoring is vital for all of us to continue our journey of learning…..”. How true that is. I’ve been thinking about your ideas since I first read the post several days ago. On the incremental v total innovation front, it’s probably the case that we see the end results of innovative change when they are presented at a conference or on a school visit or in an article etc (even in a blog post such as this) and forget that even – and especially – massive change usually happens as the result of successful leadership of a long process of change rather than a blitzkreig of immediate change. Lots of people working over a long period of time to make something work (or change direction as needed). I will be very interested to see what actually becomes of an education system when more and more of the schools which make up that system are evolving into hubs of effective and engaging learning rather than simply curriculum-delivery factories. What effect might this have on the BOSTES? on the HSC? on K-12 schooling itself? And, most importantly, when will students begin rejecting schooling en masse that doesn’t change to suit the needs of their world? Will we end up with a whole lot of buildings and teachers with noone to teach? Thanks for writing the post and making me think! With so many schools making changes – in whatever way, is it already time for BOSTES to change? I am always surprised when they are cited as one of the biggest barriers to change. I have seen stephen Harris speak and a representative from Parramatta Marist. I was very impressed with PM. What they have done is so impressive and very exciting, and with a mix of students – and not necessarily a truckload of money. Certainly their example is attainable for any public school who have the leadership to try. To me, that’s the key. Leadership. Having an executive team that model the change, are able to articulate the vision and its purpose. But also, are willing to “call out” the white anting if it rears its ugly head.